From Camp Hill Bottom Lock cross the rope scarred iron bridge made by Lloyds, Fosters & Company of Wednesbury and turn right. As you head dead straight don’t be alarmed if you encounter knuckle dragging neanderthals wearing blue and white scarves. We are near to Birmingham City’s football ground and their supporters are too far down the evolutionary scale to be anything more than just a nuisance. With new flats eventually breaking up the industrial monotony, there are adjacent moorings but this is not a tourist hot spot. Traffic on the canal since Catherine de Barnes has been non-existent, a far cry from when the junction canal was the M6 Toll road of its day. As you continue, note that older road bridges have brickwork cut out that allowed fire engines to extract water from the canal during the blitz. Planes could follow the canals by moonlight and bridge 101 carries shell damage but personally I couldn’t detect it. Though you are adjacent to the Proof House railway junction where three main line railways meet, surprisingly the area around Garrison Top Lock can be quiet if not pretty. But the reality is that you are boxed in by roads and railways and soon again enveloped in the sights, sounds and smells of industry. 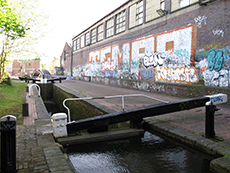 Crashing and banging from a giant scrap yard needs to be heard to be believed as the canal descends through the next four locks. Saltley Dock is where Fellows, Morton and Clayton once had their main boat building operation and the seemingly endless urban activity continues until bridge 108 when the canal straightens along a paint plastered wall but is no longer industrially claustrophobic. There is however a big paper recycling facility next to the Saltley Narrows on the other side of the parallel River Rea but, once past two gasometers and across the river, there are actually playing fields and a wildlife pond. Nechells Power Station is now Star City, again with moorings if you fancy a wager in the casino. The complex contains other entertainment such as a 24 screen cinema, ten pin bowling etc. Just before Salford Junction the canal narrows to a boat width, this is Nechells Shallow or Stop Lock. Presumably the original lock cottage didn’t require protective razor wire. The end of the Grand Union is nigh when it meets the Tame Valley and the Birmingham and Fazeley canals under Spaghetti Junction. Opposite you was once the HQ of boatbuilders and carriers T & S Element who in the 1930s and 40s operated around 200 craft loaded with a huge variety of industrial products but by the 1970s this was reduced to six carrying rubbish from factories. There was also fuel merchants and boatbuilders Spencer, Abott & Co. which was established in 1913 by Howard Spencer, a player and then director from Aston Villa's golden era, who was nicknamed 'The Prince of Full Backs'. Salford Junction epitomises the fate of water transport, a 19th century landscape is now dwarfed by the 21st, three canals carrying pathetically little traffic and largely forgotten by eighteen intertwined roads that tower above them carrying 200,000 vehicles every day. Spaghetti Junction took eleven years to plan, four years to build and used 13,000 tonnes of steel and 175,000 cubic yards of concrete. It opened to traffic in 1972. There were once three gas works in this area at Saltley, Adderley Street and Nechells manufacturing ‘town gas’ from coal carried by the canal. As the country's primary manufacturing centre Birmingham produced the majority of spitfires during the second war and also a myriad of other ordnance and equipment vital to the war effort. Heavy bombing was therefore expected and delivered between August 1940 and April 1943. The BSA factory was destroyed in November 1940 killing 53 workers and overall around 2,000 tons of bombs were dropped on the city making it the third most heavily bombed place in the United Kingdom, behind only London and Liverpool . The area isn't culturally dead, surprisingly enough accordion players can get their instruments repaired at a specialist shop above bridge 104b.